I know, I’d said I wouldn’t present you with another tart any time soon, but this is a great dish for a warm spring day. It’s also a nice addition to your next picnic basket. Preheat your oven to 220°C/425°F and line a large baking tray with parchment paper. In a large bowl, toss the tomatoes with the olive oil and basil. Season with salt and pepper. Place the tomatoes on a baking tray, cut side up, and bake on the upper rack for about 15 minutes, until softened slightly. In the same bowl as the tomatoes, mix the cheese(s) with the lemon zest and juice, some salt and pepper. I used ground Sichuan pepper for a special fresh kick. Prepare your dough (you’ll find the recipe for the pastry here) or line a baking pan with parchment paper and roll out your pastry, making sure you push the pastry well into the corners. Prick all over the bottom with a fork or weigh your pastry down with some baking beans. It will prevent your pastry from puffing up while blind-baking. Once your tomatoes are roasted, lower your oven temperature to 180°C/350°F, and bake your pastry for about 10-15 minutes. Allow your pastry to cool for a few minutes before spreading the cheese mix on top. 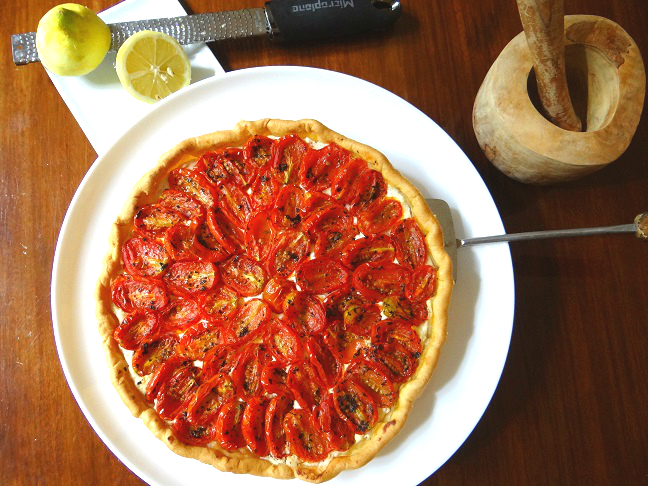 Arrange your roasted tomatoes on top and bake for another 30-40 minutes, or until your pastry is cooked through.